Since becoming a parakeet parent I’ve been on a mission to figure out a way to ensure regular baths. We started out with JW Pet Company Insight Bird Bath Bird Accessory , which would have been really cute, but was a total fail. Toby couldn’t figure out how to get in the bath, and when she landed in it accidentally she acted like it was a cruel trick. So, we started trying other options with varying degrees of success, as always your mileage may vary. I also want to note that seeing a bathing budgie for the first time can be a little disconcerting, they puff up to the extreme and hold their wings out at odd angles, looking a little bit broken and very intense about the activity. Misting – we purchased a tiny misting spray bottle and filled it with comfortable temperature water; I held it above Toby’s head and misted. She behaved as though I was punishing her for some terrible transgression and this was the worst torture I could have devised. Run a sink at a low pressure – I held my hands out with the palms up under the stream and splashed gently around in the water. Toby would come stand on my hands and walk around in the water. She drank copious amounts but never seemed inclined to walk under the waterfall. Water bowl – very similar to the bath we started out with. No one wants to go near a bowl of water, either a food bowl, cereal bowl or small ceramic bowl. Shallow dish with leafy greens and water – huge hit with Kelly, she was initially wary but as soon as I lured her into the dish (with millet) she immediately fluffed out and started rubbing her tummy and face all over the greens. She hasn’t flipped completely over yet but gets her front very wet. If the whole plate is too intimidating you could also try some wet lettuce leaves held in your cupped hands. 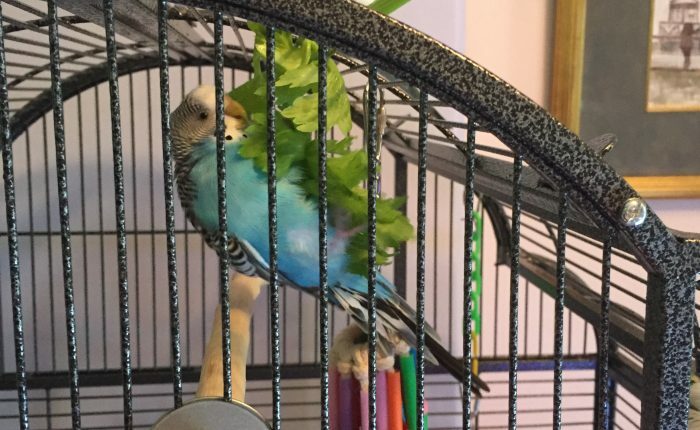 Hanging wet leafy greens – This is what works best for Toby, hang some wet kale or celery tops from the ceiling of the cage and she is a mad man for bathing. The key is making sure the greens are secured really well, because she hangs from them as she bathes. Bath time is so important and helps the parakeets feel good and healthy, especially when molting. 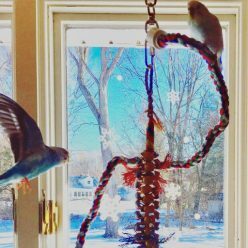 Keep experimenting and you’ll find a method that works for your parakeets, and even when it fails the experience is still an enrichment! We subsequently tried a Lixit quick lock bird bath and the review of that can be found here.